New Adventures in Learning, a lifelong-learning program, offers a full roster of classes designed for active, older adults. Wayne Wright, President of the Governing Council, points out the convenience of the neighborhood program with its location at the corner of Riggs and Alma School Roads in Sun Lakes. “New Adventures is our area’s lifelong-learning program, and it is accessible to all residents. Our classes are presented with state-of-the-art technology in very comfortable classroom settings.” Members or local experts share their knowledge on a wide array of topics. Many classes start later in the spring semester and still have seats available. 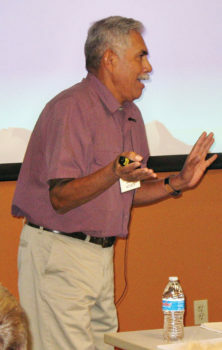 In one of these, William Allen will present “A Brief History of the Gila River Indian Community.” Using slides and short stories, the presenter will provide a quick historical overview of the Gila River Indian Community. The Akimel O’odham have been in this location for many generations, and their history reflects the changes their people have endured.” William Allen is a member of the Gila River Indian Community and a retired history teacher. Below are a few other classes that begin in March or in April. Members can review the list of these and many other classes at http://www.newadventures.info. For more information, call 480-857-5500 or visit the Sun Lakes Center at 25105 S. Alma School Road, Sun Lakes, AZ. New Adventures in Learning is affiliated with Chandler-Gilbert Community College. If you are a new member or need to renew your dues this month, the fee will be $25 for the spring and summer semesters both. Add an additional $15 college registration fee each semester you enroll in one class or more. ← Interested in practicing Spanish?